The Plan’s prescription drug benefits are administered by Express Scripts. All participants eligible for prescription drug coverage receive an Express Scripts ID card. This card includes your Express Scripts ID number and should always be with you when you visit a pharmacy or your doctor’s office. If you misplace your card, you can print extra copies of your card or fax it directly to your doctor or pharmacist from your Benefits Manager account. Please see the Summary Plan Description for more information on coordinating your prescription drug benefit with Medicare, annual pharmacy deductibles, copays and the Preferred Prescriptions Formulary. 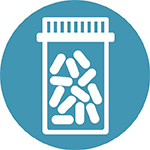 In order for a medication to be considered a short-term prescription, it can be filled no more than twice at a retail pharmacy, for a maximum of a 30-day supply with each fill. Short-term prescriptions should be filled at Express Scripts participating retail pharmacies. To find your local pharmacy, log in to the Express Scripts website, select "Locate a Pharmacy" from the menu and search by zip code or city and state. You can also search for local pharmacies through the Express Scripts mobile app and get turn-by-turn directions to the nearest participating retail pharmacy. Long-term prescriptions are typically maintenance drugs that are taken for an extended period of time. Any medication that requires more than two refills of a 30-day supply is considered long-term and must be ordered through Express Scripts home delivery or a participating Smart90 Walgreens Network pharmacy. 1. Register on the Express Scripts website, download the Express Scripts mobile app, or call Express Scripts customer service at (800) 903-4728. 2. When you are prescribed a new long-term medication, ask your doctor for two prescriptions: the first for a 30-day supply to be filled at a retail pharmacy and the second for up to a 90-day supply to be filled through the home delivery pharmacy. 3. With your Express Scripts ID number, ask your doctor to submit your prescription to Express Scripts via E-Prescribing or fax. You can submit your prescription yourself online on the Express Scripts website or by mail by requesting an order form from Express Scripts at (800) 903-4728. 1. To find a Walgreens network pharmacy, log in to the Express Scripts website, select “Manage Prescriptions,” and look for the link directing you to the network. 2. Ask your doctor to submit an electronic 90-day prescription plus refills via E-Prescribing or fax to your preferred Walgreens Network pharmacy. If you are switching from the Express Scripts home delivery, you will also need a new 90-day prescription with refills sent to your participating Walgreens. 3. Your prescriptions will automatically be refilled and ready for pick up every 90 days. For more information about long-term prescriptions or to locate Walgreens Network pharmacies, contact the special Express Scripts Smart90 Walgreens Network customer service line at (866) 890-1419 or log in to the Express Scripts website.